For many years, blood cholesterol has been recognized as an independent risk factor for cardiovascular disease and mortality. Although it’s not considered the most important risk factor anymore, the fact remains: high blood cholesterol and an abnormal blood lipid profile can contribute to the stiffening of arteries, leading to atherosclerosis, with dire implications for human health. Cholesterol is a natural substance, crucial for cellular health; without it, life is impossible. When we say “high cholesterol,” we are actually referring to a group of lipoproteins, specialized molecules that act as cholesterol carriers, transporting cholesterol from and to the liver, and peripheral organs. 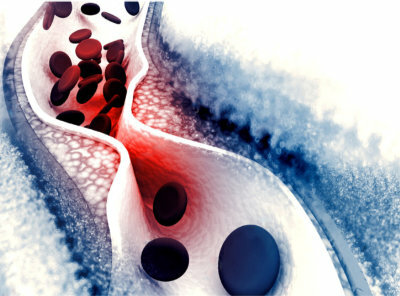 When arterial buildup of cholesterol occurs, arterial walls become thickened and stiff. This change results in loss of their elasticity, which, in turn, may cause a rise in blood pressure leading to hypertension. Moreover, the incidence of atherosclerosis is promoted, which refers to the creation of plaques in the arteries inner walls. As they become larger, these plaques may eventually rupture, causing blood clots that can block blood circulation to the heart or the brain, causing coronary syndromes and strokes. So far, the mainstay of treatment against high cholesterol has been the reduction of LDL and triglycerides, and the increase of HDL. Any intervention that causes a change in this pattern, either through diet, exercise, or medication, has been considered effective. As far as medicines are concerned, statins have been the golden standard for the past 2 decades. Yet, as is the case with any medication, statins are not free of side effects. They are associated with myalgia (muscle pain), liver toxicity and, recently, have been discovered to increase the risk of incident diabetes. Fortunately, cholesterol and atherosclerosis reduction is possible through natural means, like vitamin C.
In 1986, Harwood, Green and Stacpoole discovered that vitamin C has the capacity to inhibit the enzyme HMG-CoA reductase in vitro, revealing that, on the molecular level, vitamin C can act as a statin . In fact, its inhibitory activity was proportional to its concentration; the higher the concentration, the more pronounced its activity. Moreover, through its antioxidant activity, vitamin C may prevent the oxidization of LDL, which is the root behind most problems of the kind. In 2000, Kurowska and colleagues reported that orange juice high in vitamin C significantly increased HDL (good) cholesterol levels while decreasing LDL (bad) cholesterol levels in healthy humans with high blood cholesterol, providing early clinical evidence of ascorbic acid’s lipid lowering capabilities . Another important study carried out in an Iranian hospital in 2007, showed that supplementation with 1000mg of vitamin C was able to decrease LDL and triglycerides in type 2 diabetes patients . However, 500mg failed to produce the same event, underlining the importance of achieving high plasma concentrations of ascorbic acid. Finally, two important studies were published in 2014. The first, by David Højland Ipsen and colleagues showed that low vitamin C levels are correlated with Fatty Liver Disease in the general population, a metabolic disorder that is closely related to abnormal blood lipids and metabolic disorders in general . The second, by Siavash and Amini, showed that vitamin C may have HDL-raising effects similar to those of the prescription drug Gemgiprozil, on patients with type 2 diabetes, favoring cardiovascular health . So, vitamin C has the ability to improve lipidemia. But in order to do so, sufficient plasma concentration must be achieved. Unfortunately, traditional oral supplements fail to reliably maintain a sufficiently high vitamin C concentration, due to problems in absorption. That’s where liposomal technology can help, as it has been shown to be at least 50% more effective than conventional high-dose ascorbic acid supplements . Goldman Laboratories are a leading researcher and a designer of liposomal encapsulation products, among which a highly bioavailable form of vitamin C, LIPOSOMAL VITAMIN C 500MG. By using a high-quality, true liposomal vitamin C supplement, it is possible to achieve proper vitamin C plasma concentrations. : Harwood J, Greene Y, Stacpoole P. Inhibition of human leukocyte 3-hydroxy-3-methylglutaryl coenzyme A reductase activity by ascorbic acid. An effect mediated by the free radical monodehydroascorbate. The Journal of Biological Chemistry. 1986;261(16):7127-7134.
 : Kurowska E, Spence D, Jordan J, Wetmore S, Freeman D, A Piché L et al. HDL-cholesterol-raising effect of orange juice in subjects with hypercholesterolemia. The American Journal of Clinical Nutrition. 2000;72(5):1095-1100.
 : Afkhami-Ardekani M, Shojaoddiny-Ardekani A. Effect of vitamin C on blood glucose, serum lipids & serum insulin in type 2 diabetes patients. The Indian Journal of Medical Research. 2007;126(5):471-474.
 : Ipsen D, Tveden-Nyborg P, Lykkesfeldt J. Does Vitamin C Deficiency Promote Fatty Liver Disease Development?. Nutrients. 2014;6(12):5473-5499.
 : Siavash M, Amini M. Vitamin C may have similar beneficial effects to Gemfibrozil on serum high-density lipoprotein-cholesterol in type 2 diabetic patients. Journal of Research in Pharmacy Practice. 2014;3(3):77.
 : Bell, Davis J, Paris H, Beals J, Binns S, Giordano G et al. Liposomal-encapsulated Ascorbic Acid: Influence on Vitamin C Bioavailability and Capacity to Protect Against Ischemia–Reperfusion Injury. NMI. 2016;:25.